Folks - I'll be at one of these fine place this week. if you are in the area, please stop by and say hi! Thursday, September 27 - Alleghany County Public Library - 6:30 pm. Monday, October 1 - Big Ivy SCV Camp - 7:00 pm. 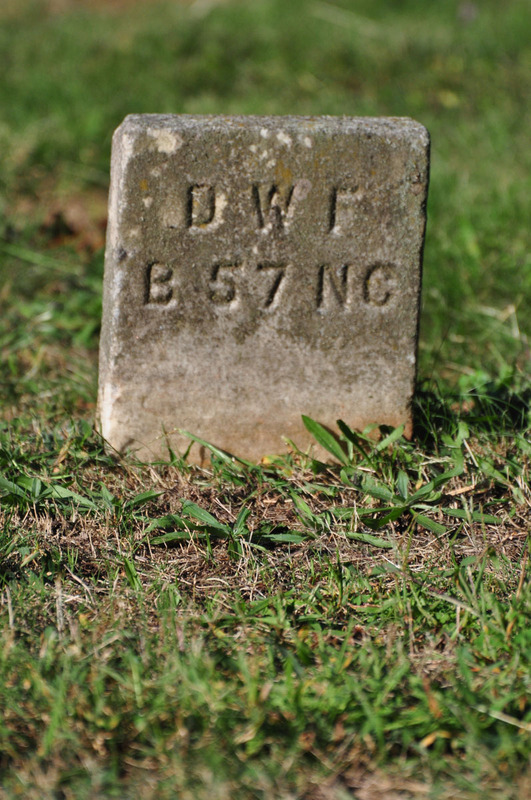 Richard Burnett lived in Franklin County where, at the age of 28, he enlisted on October 18, 1862. 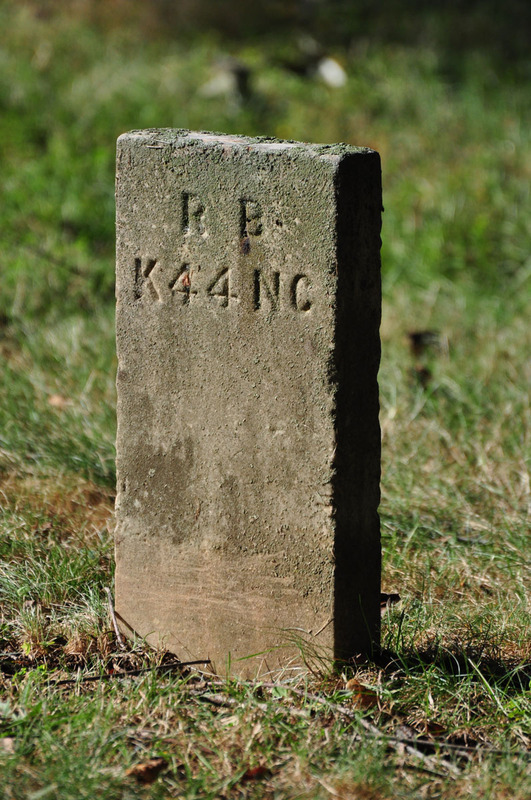 He was mustered in as a private in Company K, 44th North Carolina Troops. Burnett served almost a year before dying in one of the Lynchburg hospitals of "phthisis pulmonalis" on or about September 28, 1863. I took this image in September 2012. 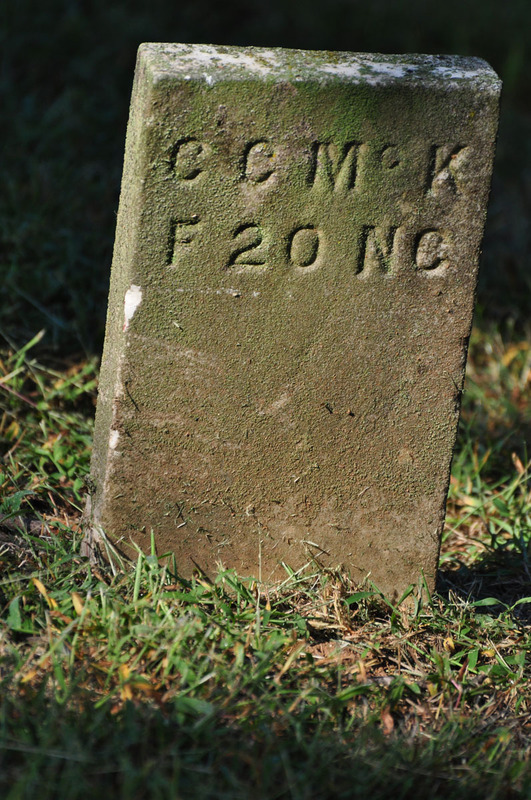 C. C. McKenzie was living in Sampson County when he enlisted at the age of 20 on March 27, 1862. He was mustered in as a private in Company F, 20th North Carolina Troops. 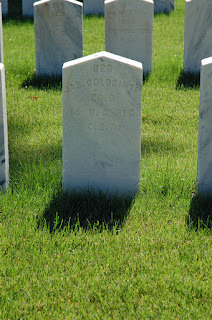 He served for almost a year, being reported either present or accounted for, until he took sick and died in a hospital in Lynchburg on February 20, 1863, of "pneumonia." 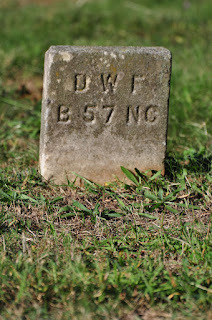 David W. Ferrill was 30 years old when he enlisted in Rowan County on July 4, 1862, in Company B, 57th North Carolina Troops. He was hospitalized in Richmond in November 1862 with rheumatism, but returned to duty on December 30, 1862. Corporal Ferrill died on February 28, 1863, in a hospital in Lynchburg, of laryngitis. Sorry about the slow posting as of late. I've been traveling, speaking to various groups. On one of my trips, I was speaking to the Round Table in Lynchburg, Virginia, and got to revisit the Old Lynchburg City Cemetery. Over the next few days, I'm going to try and tell a few of stories behind some of the pictures of stones that I captured. Lynchburg became a vast hospital complex during the war. There were 31 different structures (based upon a map at the cemetery) that served as hospitals. An estimated 20,000 men were treated there, with 3,000 deaths (Confederate and a few Federal). The photo above is just one of the Confederate monuments in the cemetery. This monument is dedicated to those who died of smallpox during the war. I have visited this cemetery twice: once when I was working on the book on the 37th NCT, and again in September 2012. On the road this week. Tuesday, 9/11/2012 - Yancey County and the Civil War - Burnsville (NC) Public Library, 6:30 pm. Friday, 9/14/2012 - Antietam program, William YMCA, Linville, NC, 7:00 pm. My travels take me many places, and I consider myself blessed. 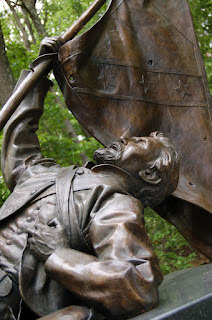 In June of 2010, I visited and spoke with the Civil War Round Table in Columbus, Ohio. 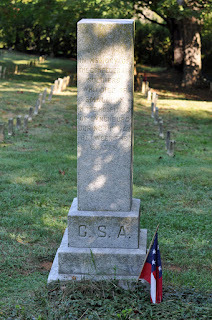 While in town, I visited the Camp Chase Confederate Prison Cemetery and took photographs of as many North Carolina soldiers as I could find. This is the grave of Pvt. 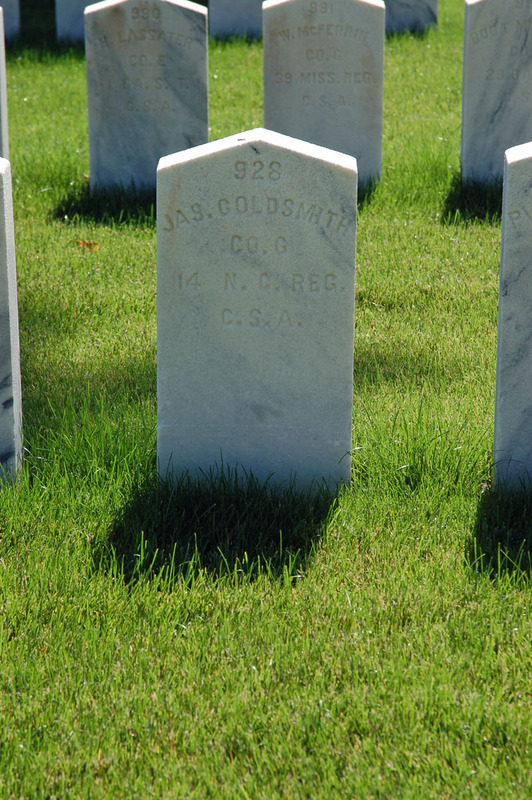 James K. Goldsmith of Company G, 14th Battalion, North Carolina Cavalry. Company G came primarily from Henderson County, North Carolina. Records are poor, mostly limited to an undated bounty roll, except for four men: James M. Calloway, Robert B. Clayton, David H. England, and James R. Goldsmith. All four were captured on December 13, 1864, in Cooke county, Tennessee, and all four were sent to Camp Chase in Columbus, Ohio. Clayton and Goldsmith would not survive. Clayton died on February 11, 1865, of pneumonia, and Goldsmith on January 28, 1865, of "general devility. "(That's what is says. I imagine it was supposed to be "debility," but I've known a few folks who could have died of "devility," or could have killed other people with it.). I took this photo in June 2010. The Thirteenth marched across South Mountain and camped near the hamlet of Boonesboro. Soon, however, we had to retrace our steps to meet the enemy on the summit of South Mountain. On this battlefield the Thirteenth, under the command of Lieutenant -Colonel Thomas Ruffin, covered itself with glory. Garland's Brigade was all the force we had to defend the pass against a division under General Butterfield. Early in the action General Garland fell, mortally wounded, and the command of the brigade fell to Colonel Duncan K. MacRae. Brigade after brigade of the enemy assaulted our line, but each time were driven back with heavy loss. There is hardly any doubt that we killed and wounded more of the enemy than we had in our ranks. Never was there a more stubborn contest, for we were told that the lines must be held, that we had no reserves, and that every man must do his whole duty. Provisions were cooked in camp and carried up the mountain and our men fed in line of battle... There is no instance in the war where more heroic courage was exhibited than was shown by the Thirteenth North Carolina in this battle. Captain Chalmers Glenn, of Rockingham, fell in this battle and was buried by his faithful servant, Mat, the grave being dug with a bayonet. If is said that Mat died of a broken heart at the loss of his best friend, and hence the grave was never found. 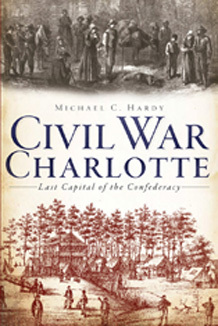 There was some great news this past week concerning Civil War Charlotte: Last Capital of the Confederacy. There were two really good reviews. The first appeared in the Avery Journal-Times on Wednesday, and the second appeared in both the Charlotte Observer and the Raleigh News and Observer this past Sunday. You can check them out here, here, and here. A special thanks to writers Jamie Shell and Sam Shapiro for seeing the importance of this project and for their kind and thoughtful reviews. It looks like with all this great press, that Amazon is sold out and won't have more copies for a week or so. You can still get signed copies (which you cannot get from Amazon) by visiting the link to the right. News coming soon as to my next project.